How is bathtub reglazing different than bathtub refinishing? Bathtub reglazing, bathtub refinishing, bathtub restoration all refer to the process of restoring worn, impossible to clean, chipped or dated color bathtubs to look and feel like new. A bathtub can not practically be “reglazed” as this is a process that requires the heating of clay, one of the main ingredients of porcelain, in a kiln at temperatures as high as 2,500°F. 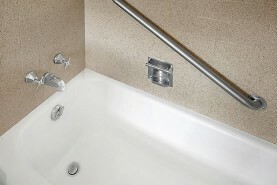 We make your tub beautiful with bathtub refinishing! Bathtub reglazing or refinishing starts with a thorough cleaning of the tub surface using especially formulated two-step cleaners to remove soap scum, mineral deposits, and body oils. Next, all cracks, chips, and cracks are repaired. Materials used to reglaze bathtubs include Miracle Method's proprietary bonding agent, MM-4, which is applied to ensure a solid bond between the old surface and the new finish. Finally, a trained professional uses a fine-finish spray process to apply a hi-tech, durable acrylic coating. The end result of bathtub reglazing is bathtub surface that looks wet, has high light refraction and has a deep gloss. Miracle Method achieves this fine finish with an extra buff and polish process, which leaves the surface silky smooth and the feel of original porcelain. 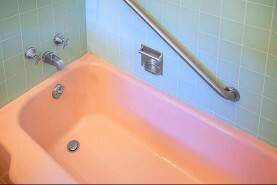 Call to find out the cost to reglaze a bathtub. When you consider the total replacement costs of tub and tile surrounds you may want to reglaze. Bathtub replacement itself can cost $3,000 or more.